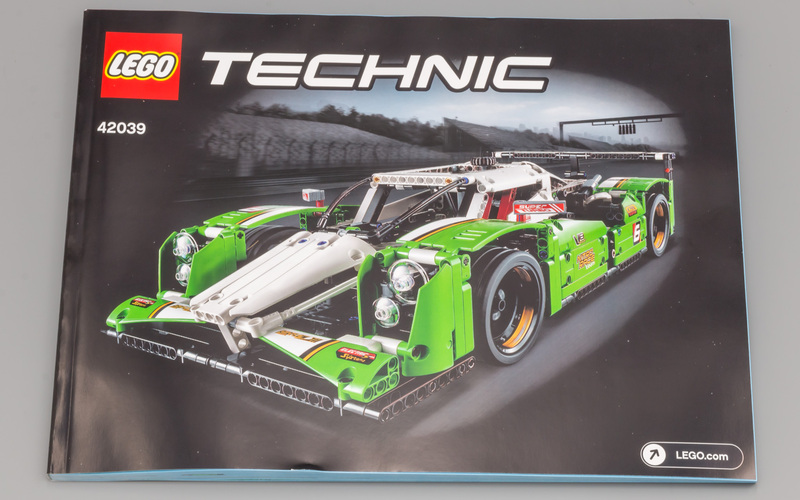 When the preliminary images of the "Le Mans Racer" surfaced somewhere last year (2014) it got a lot of praise. This changed dramatically when the final images of the 24 Hours Race Car showed up. The front side of the car, especially the head lights, and the curvature of the side of car had changed a lot. The car obviously still resembled the prototype, but the new design raised a lot of eyebrows. The new design was considered a step back instead of forward. Eventhough I still liked the design, I must admit I liked the earlier design better too. With the emphasis on past tense liked. I am not sure anymore and this review will show you why. 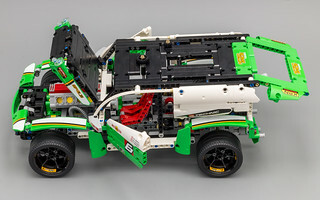 Like the Arctic Truck this set has a B-model which is well worth checking out. That's why this review includes both the A-model and B-model. 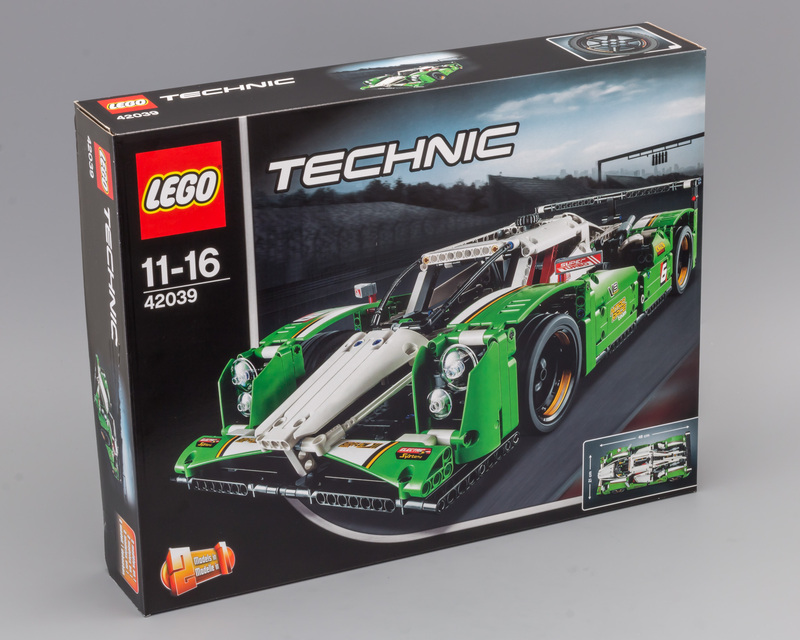 For people who are on the fence, the B-model might actually convince them to buy the set after all. Let's see what this set is all about! Note: All images can be clicked for hi-res versions. The box measures 47,8 cm x 37,3 cm x 8,7 cm and weighs well over 2kg (2110 gr to be precise). The width of the box is the same as the box of the Arctic Truck. This box also feels like it's filled to the brim. The front shows a picture of the main model in action, with radial blurred wheels to emphasize the motion of the car. The lower right section shows the dimensions of the model. 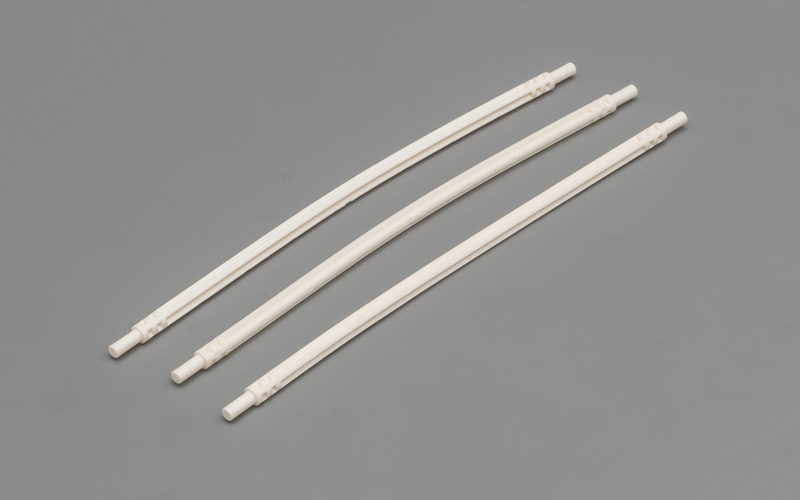 Upon completion, it will measure a length of 40cm and a width of 18 cm. 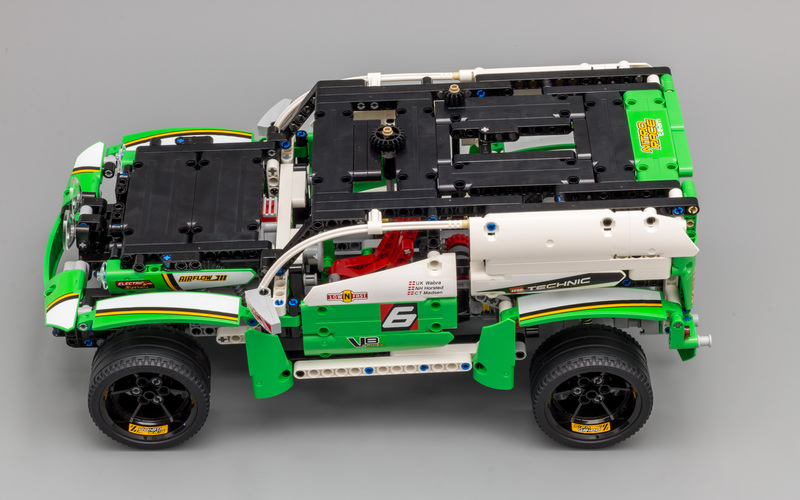 Like the front, the back side has exactly the same setup as the box of the Arctic Truck. The top shows the functions of the model, while the lower left side shows the B-model and the lower right side shows the motorization options. The picture of the B-model looks so cool, it could be a model of it's own. At this point I was very eager to build both models and compare them. 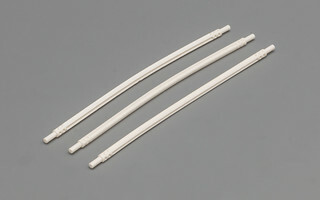 One of the sides usually shows a part in 1:1 scale. This time it's one of the wheels indicating the size of the model. Since I own two copies of the set, I also received two instruction booklets. What's catching my eye is that my second copy is supplied in different packaging than the first one. 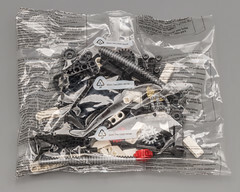 It's for the first time (that I am aware of) that the instruction booklet and stickers come in a sealed bag, without cardboard back. 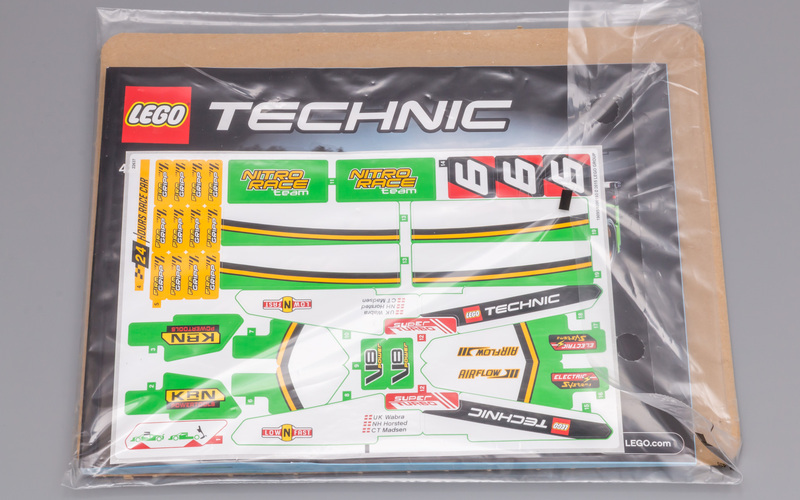 Hopefully this will be a new standard for all sets with sticker sheets. Instead of multiple booklets, this set contains a single square bound book. In earlier reviews I have epxressed my preference for a single book. I don't see any advantage in having 2, 3 or even up to 6 booklets. 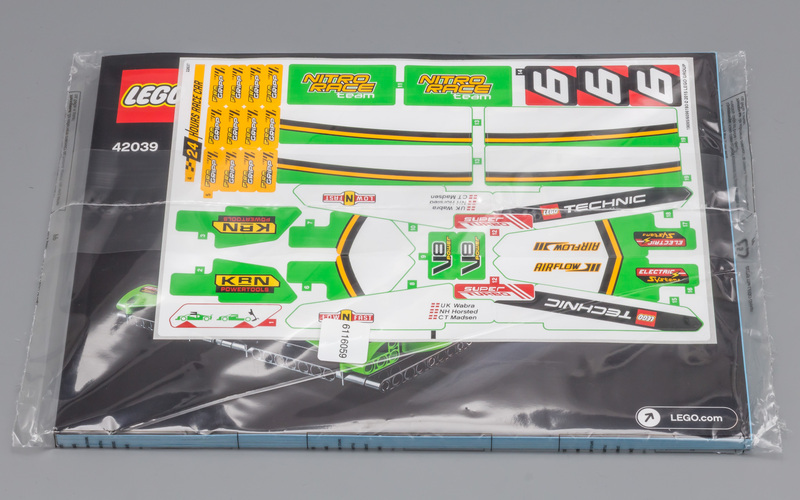 Like the actual model, the sticker sheet looks very vibrant. 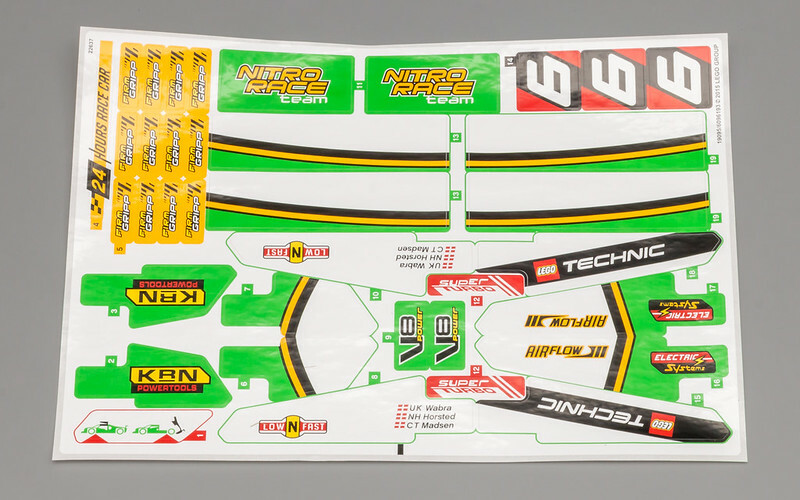 The bright green, white and black color combination has found it's way to the stickers as well. Either you love 'em or hate 'em. Since I started writing reviews I have been applying stickers and I am happy I started doing it. Stickers do give the model it's finishing touch. 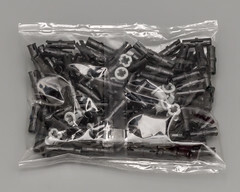 Thirteen bags with a total of 1219 parts (give or take a few) are supplied in the densily packed box. The rims and flex are sealed in a bag as well. 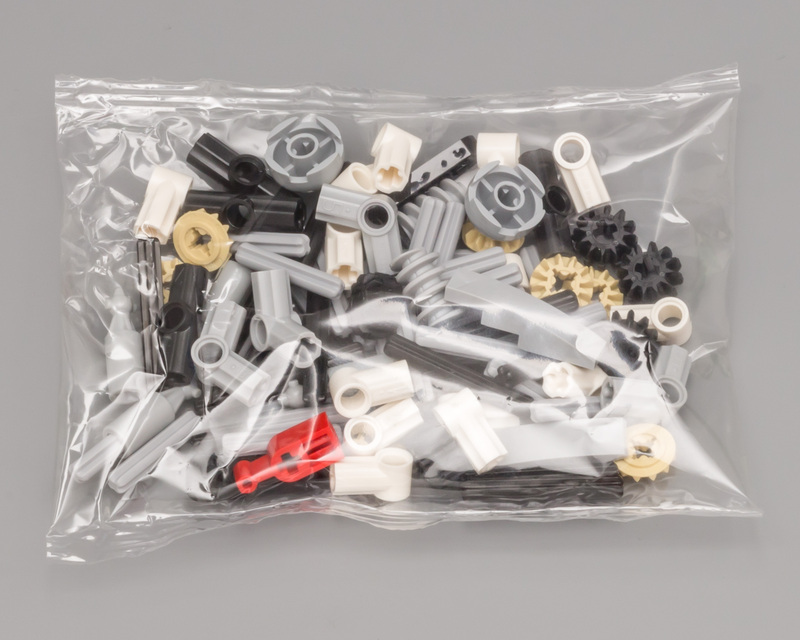 Sometimes looking at the bags makes you wonder what the logic is, behind the distribution of the various parts across the different bags. Well this time it really got me confused. Take a look at two of the bags below. 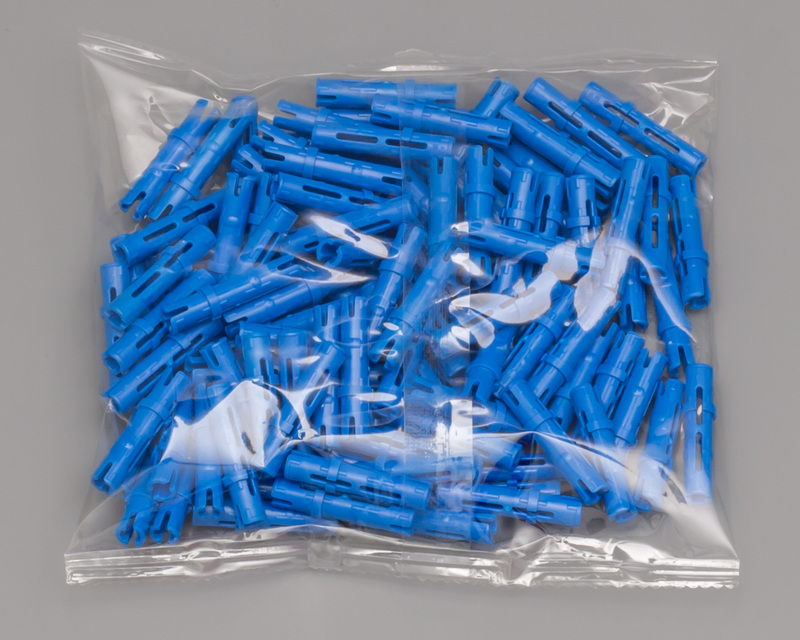 There's a bag containing all the 3L Blue Pins. Then there's a bag with various parts....and a single 3L Blue Pin. I figured this might be an error, but both of the sets have the same anomaly. 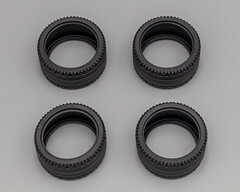 The tires have been supplied unbagged, as usual. This chapter describes new and interesting parts. 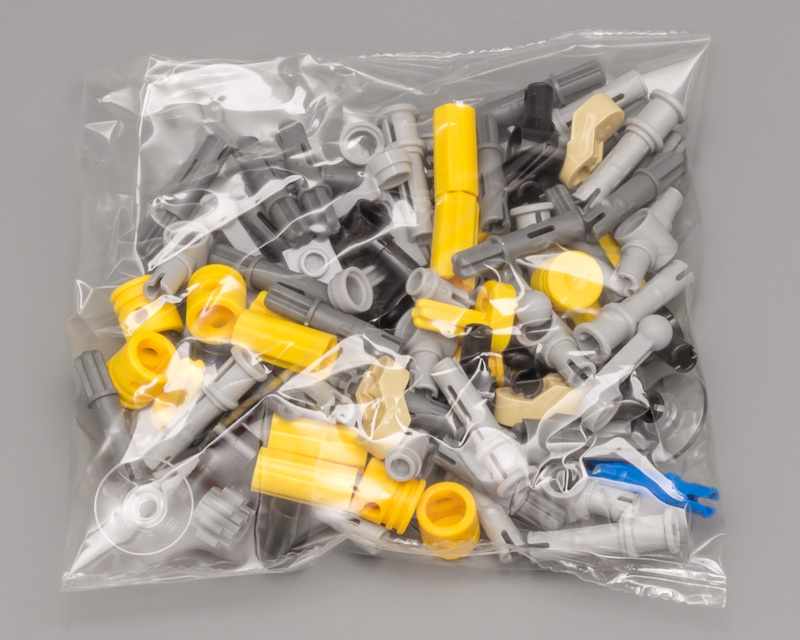 This set actually contains a lot of them. This set also contains an abundance of panels. If you aren't into panels, this isn't the set for you. 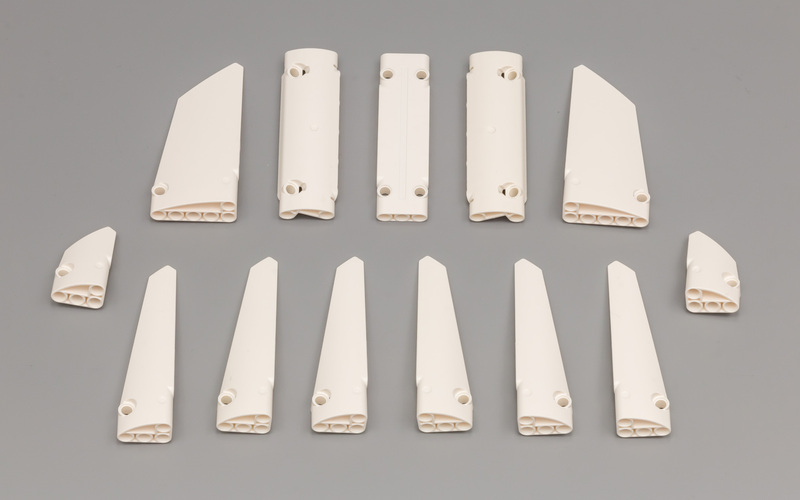 This year (2015) the new changeover catch parts were released. It's a combination of three parts. The advantage of the new parts is that the red gear is the same on both sides, which avoids mounting it the wrong way around. It also avoids the changeover catch slipping out of the driving ring, like it used to do. You can apply lots of pressure, but the catch doesn't slip out. Some of last year's new pins are also included in this set. 12 x Pin with Pin Hole and 21 x 3L Pin with 1L Axle. 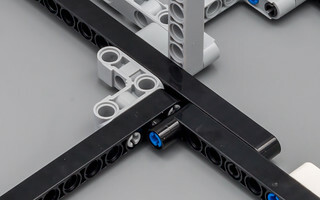 Securing Technic Beams can be quite simple with the new Pin with Pin Holes. 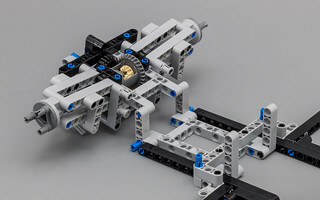 The new 3L Pin with 1L Axle gives you more possibilities when connecting Beams and other parts. 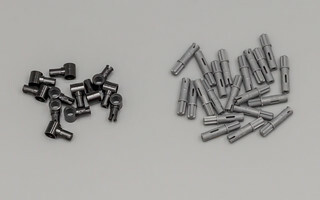 Below are two example situations where the new pins have been used. Granted, the examples below can be accomplished by using other techniques. However, some predicaments from the past can be easily solved by using these new parts. Like me, you will most likely appreciate the ease of use. 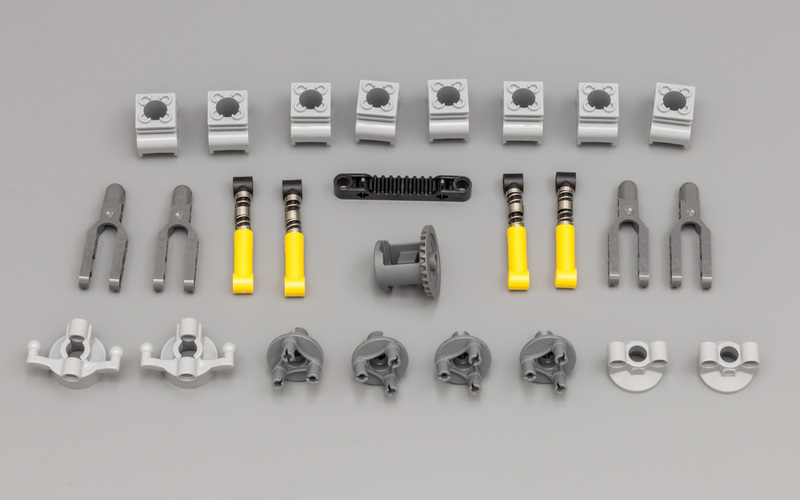 Also included are two Steering Portal Hubs and Steering Portal Hubs with Ball Joint Arms and four Steering Portal Axles for driving and steering the vehicle. 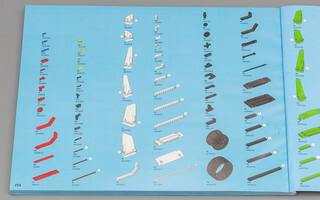 These parts are commonly used nowadays. The picture below also shows some other parts, like gear rack, steering arms and suspension. 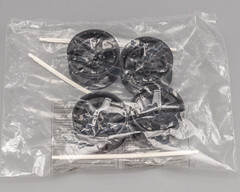 This set comes with a single 5x7 Frame and three 5x11 Frames. 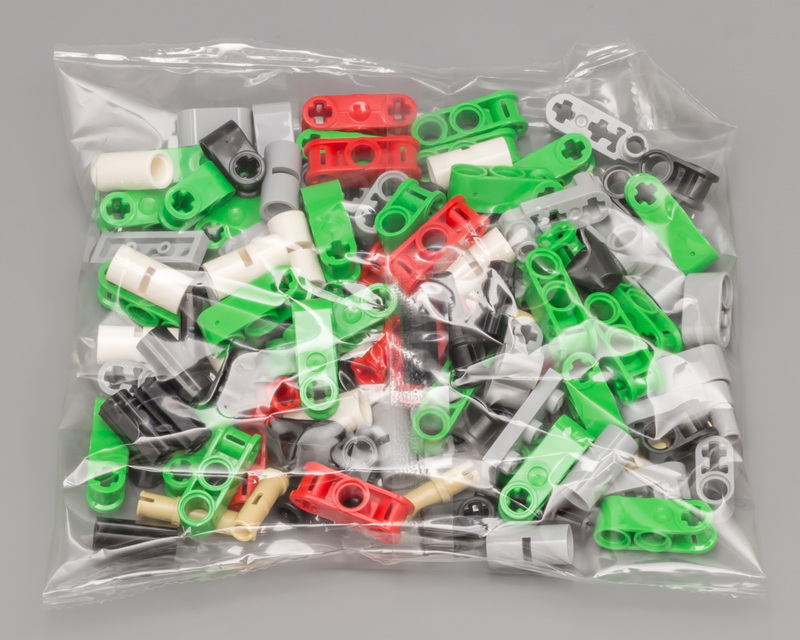 This set contains a whopping 47 panels in three different colors. I personally like panels a lot and I do appreciate the variety we have at our disposal lately. 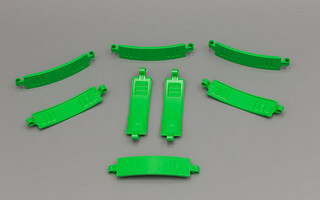 This set even contains a new 13x3x2 Curved "Mudguard" Panel. 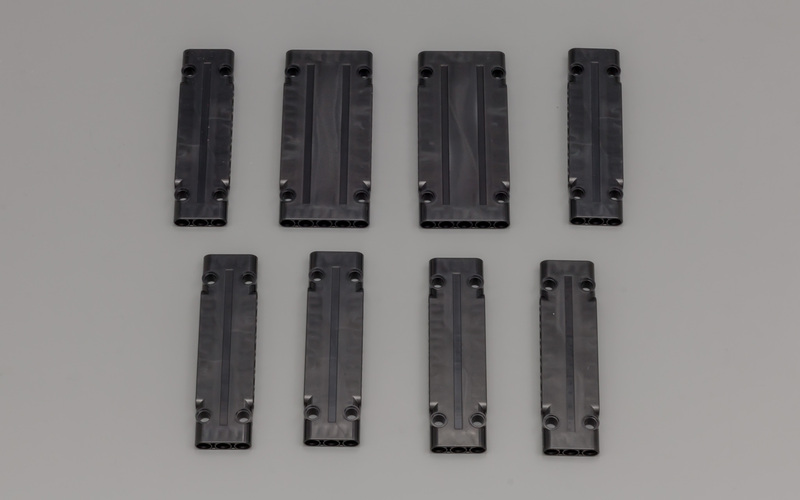 This is the first set to contain the new 13x3x2 Curved Panel. Looking at the pictures doesn't do these panels justice. In real life they are actually quite big. 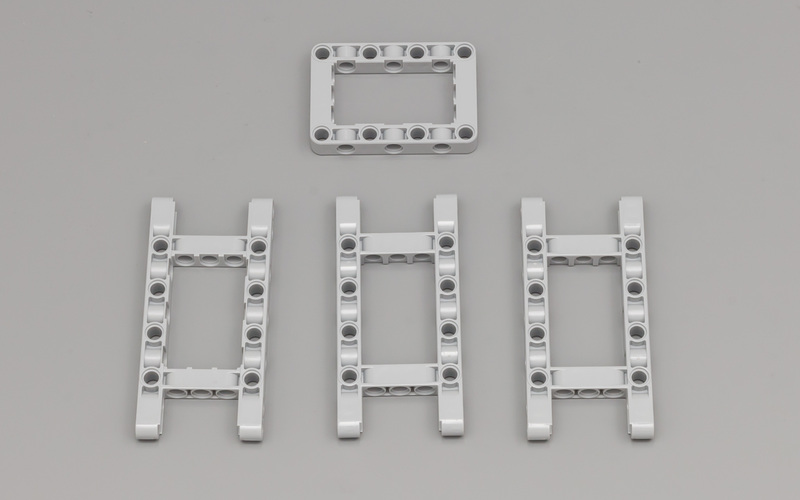 I figured they would be smaller, but they are even longer than the 11 x 5 frame, with a length of 13 (including the attachment points). Hopefully this part will be available in other colors as well, preferably white, for adding variety to your EV3 robot. 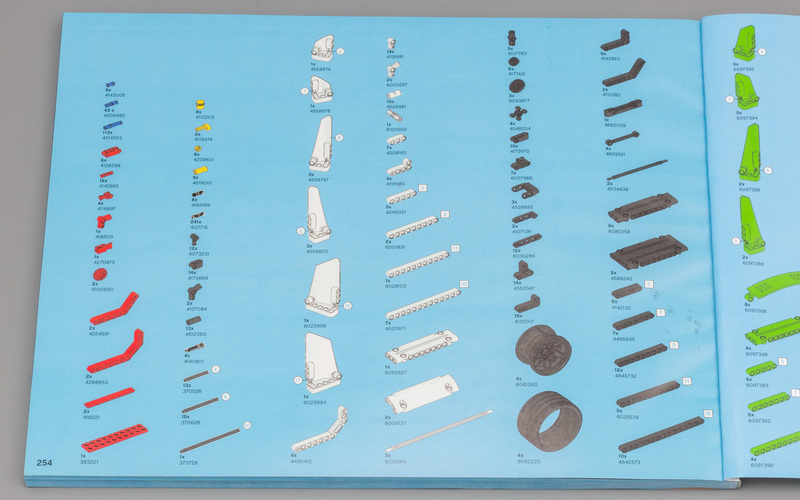 Here's the complete list for all 1219 parts. 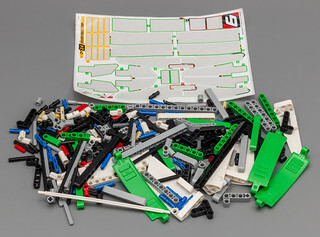 As you can see in the Highlighted parts section, this set contains a lot of interesting and useful parts. 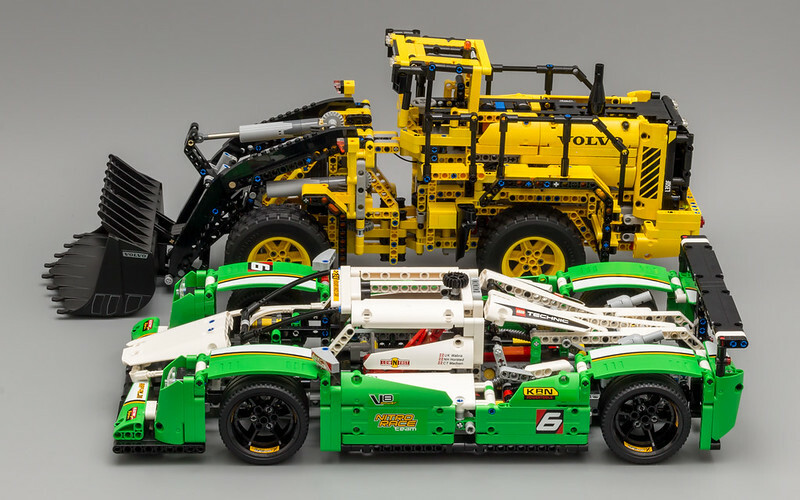 If you don't own sets like the 8070 - Supercar, this might be the set to pick up if you want to start building your own supercar. Enough with all the set and part information, let's build the model. The build starts with the rear suspension and drivetrain. 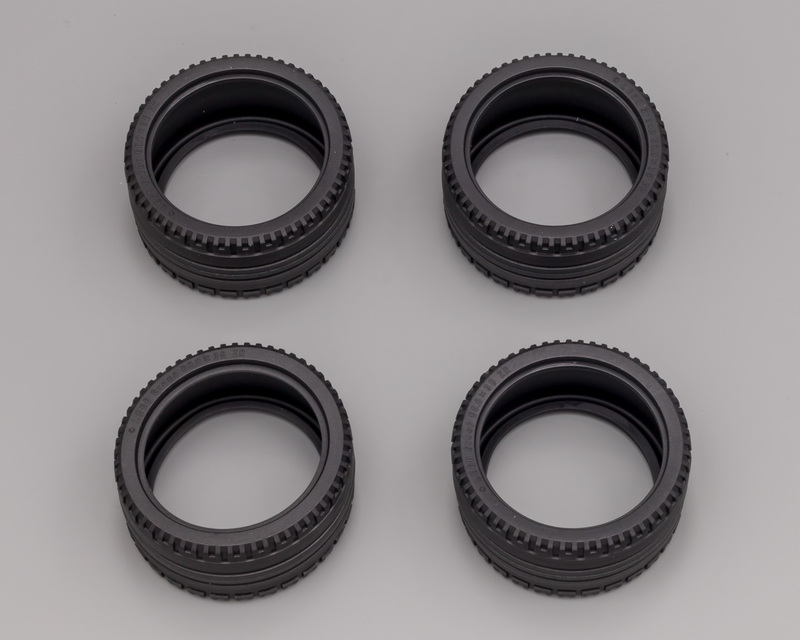 As you can see in the picture below, the length of the Axle between the Steering CV Joint is 4L, where it usally is 3L. 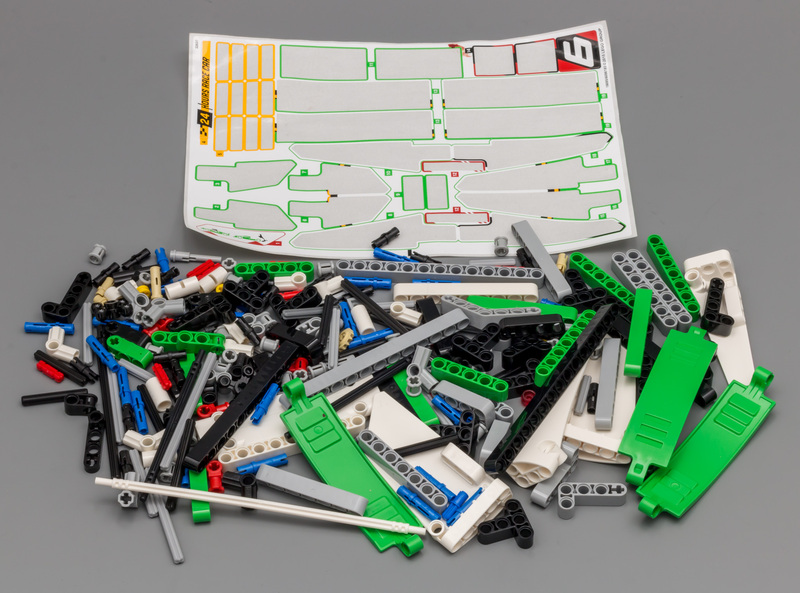 This is an indication that the finished model will be a bit bigger than usual (8070 for example). 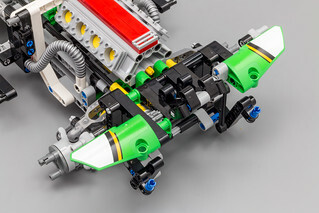 The finished suspension is one of the cleanest suspension setups I have seen in an official model. It's pretty basic, but it works like a charm. 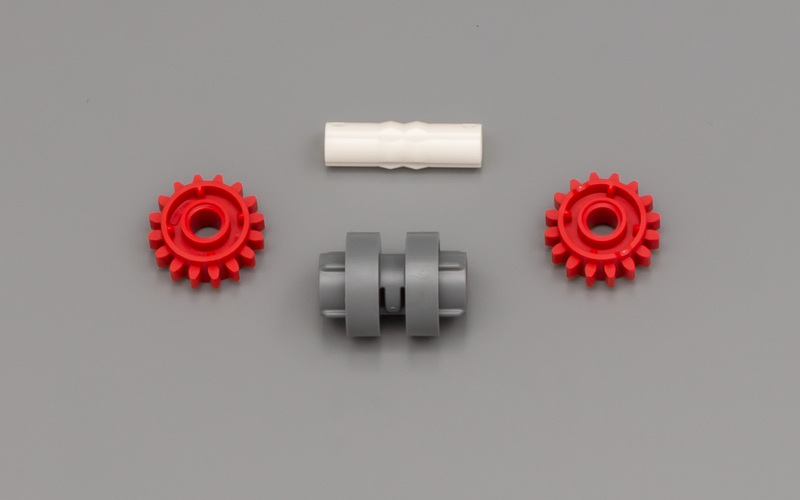 This setup is defintely worth using in your MOC. 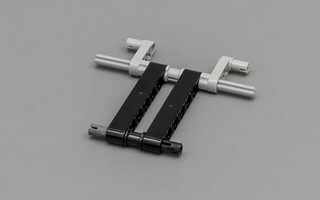 After attaching the suspension to the frame you rotate the module and secure it. At this stage the rear section of the chassis with suspension is almost finished. 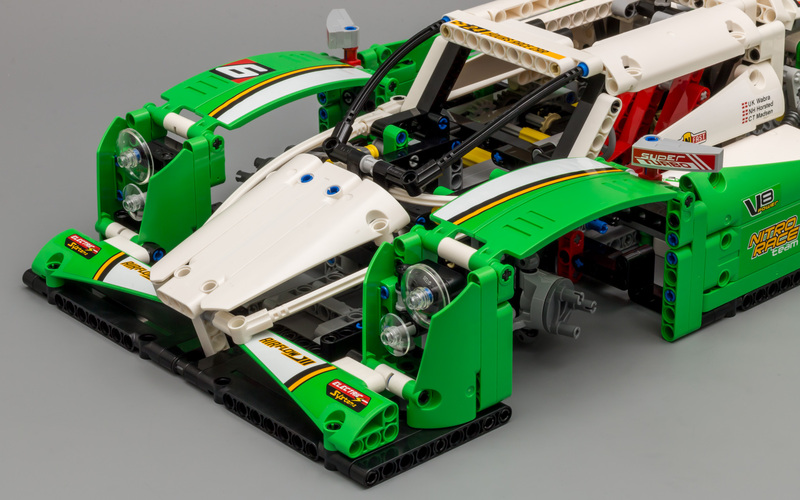 Extending the chassis forward results in the picture below, where the front spoiler is already visible. 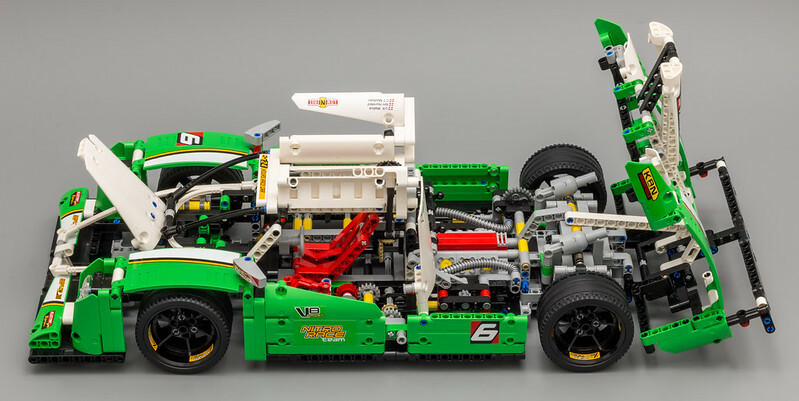 What's also visible is the V8 engine placed right in front of the rear axle, resulting in a Mid-engine setup, perfectly suited for sports and race cars. Two exhaust pipes have been fitted on either side of the engine, together with two hoses attaching them to the engine. The instructions are easy to follow, although you sometimes you need to bend the beams a bit. Minor improvements are possible here and there, but nothing shocking. 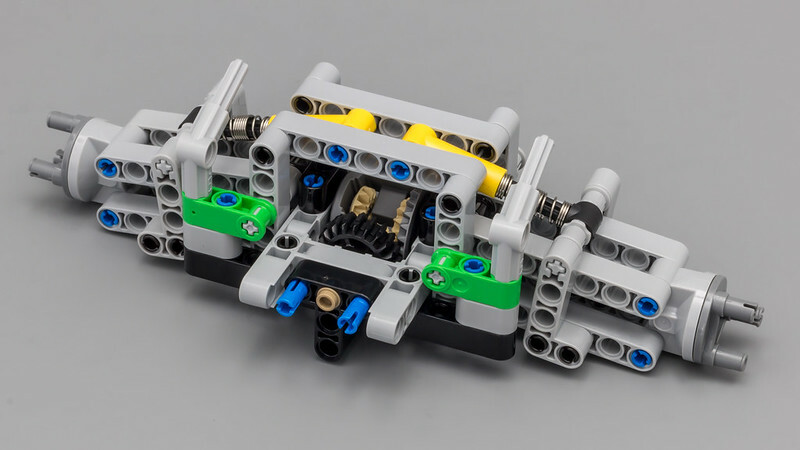 The front suspension is a bit more complicated than the rear suspension, which makes sense considering the fact it contains the steering rack. The shock absorbers are placed in a different angle than the rear ones, resulting in a somewhat stiffer front suspension. 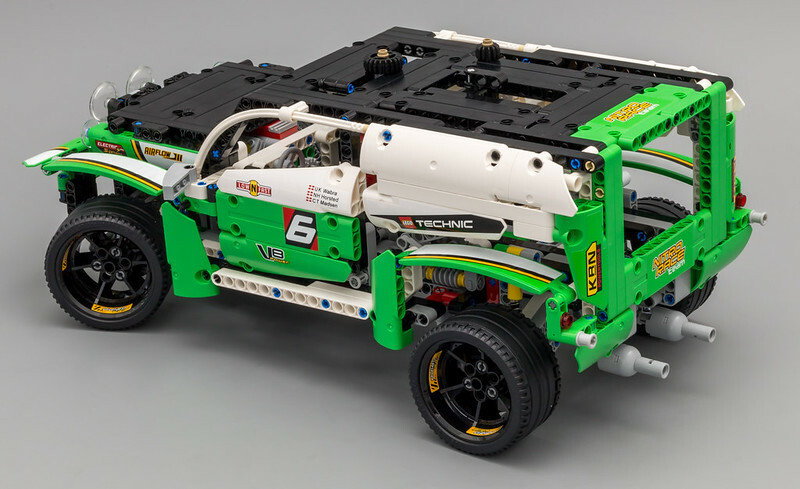 All in all the front suspension is well designed and the steering rack can be easily powered with a Servo Motor. 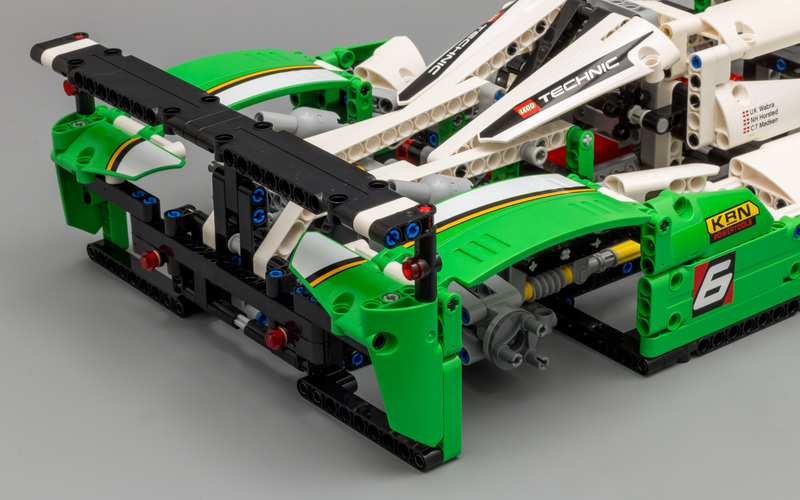 The picture belows shows the front suspension attached to the chassis. If you follow the official instructions to motorize the model, the area in front of the suspension is used to mount the battery box. 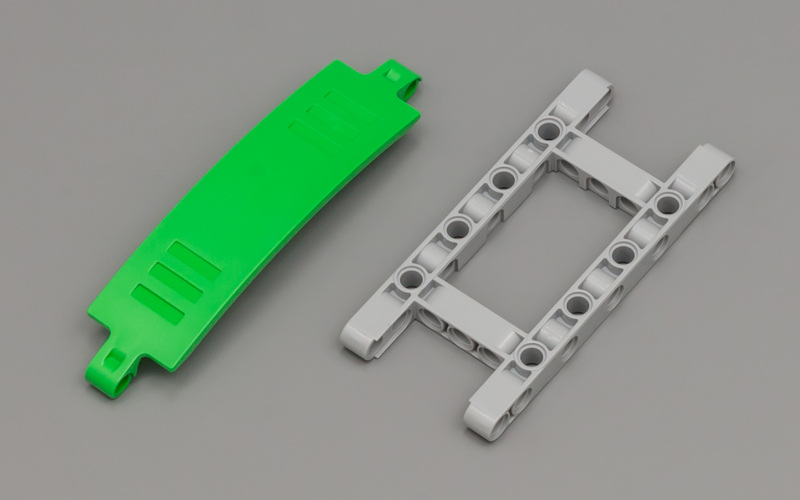 When you are modding this model to make it Full RC this area can be used to mount the servo motor. 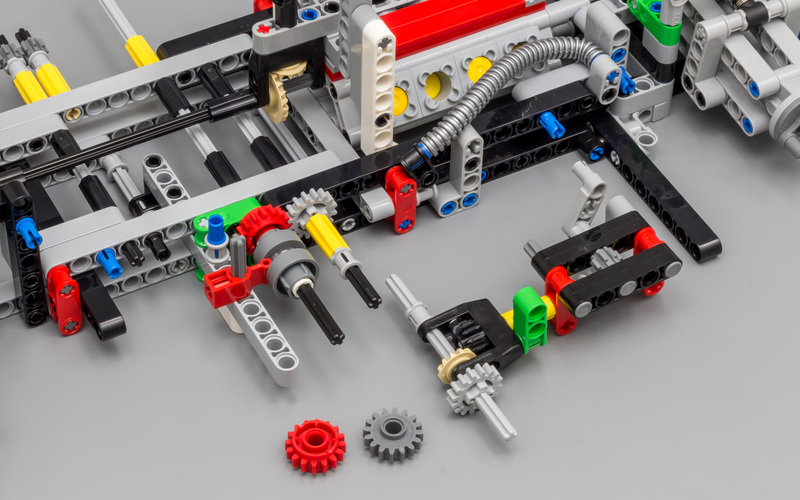 Like the gearbox in the 8070, it's not used to switch gears powering the drivetrain. It's used to switch between two functions, opening the doors and the hood/bonnet. The gearbox is located at the left of the vehicle, near the cockpit. The mechanism to open the doors is located on the left side, while opening the hood/bonnet is taking place at the right side. 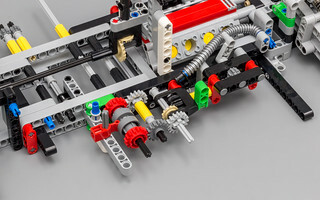 To accomplish this, some axles traverse under the cockpit to the other side of the vehicle. Following the axles to other side of the vehicle and adding some gears, results in the situation below. 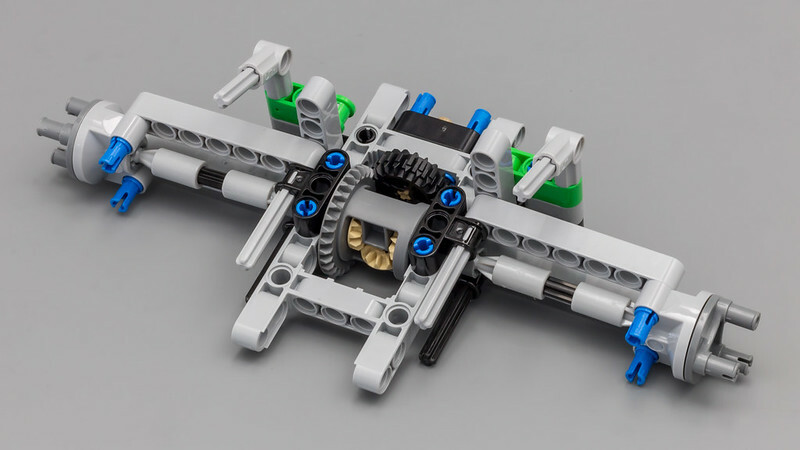 The video below shows the gearbox in action. The mechanism to open the door is comprised of some Knob Wheels, Links without Stoppers and Pins with Towballs. Take a look at the doors opening and closing. Using the new mudguards and various other panels you finish the front of the car. The front is probably the most controversial part of the car. This is caused by the preliminary pictures shown before the release of this car. In the early pictures the front of the car had smooth curves and beautiful lines, while the final car lost these smooth lines and got a more blocky look in return. 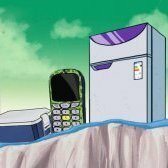 I must admit that at a first glance, the new design lost some of it's appeal. However, this model grew on me pretty rapidly. 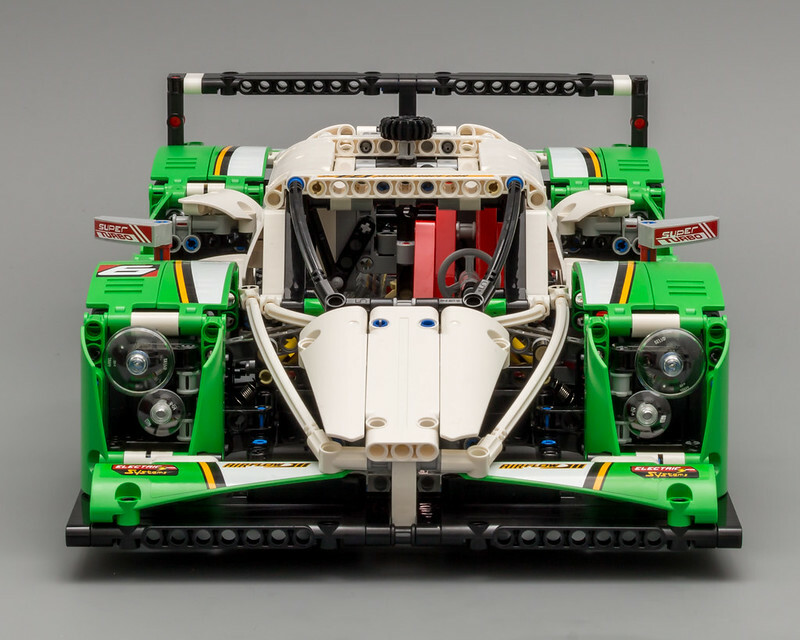 The headlight design can be found, in more or less the same way, on several real Le Mans type race cars. The rear of the car looks great, with the stickers continuing from the mudguards to the panels underneath the spoiler. The two exhausts sticking out give some details to the back. I absolutely disagree with all the negativity surrounding this car. Maybe it's one of those models which needs to grow on you. Here it is, the finished model. I know some of you don't like the looks of the car, but I think it looks great. The color scheme is outstanding. The new (for Technic) bright green parts, combined with white and black make this car look very vibrant and colorful. I am not a big fan of the green used in the 42008 - Service Truck, but I do like this bright green a lot. 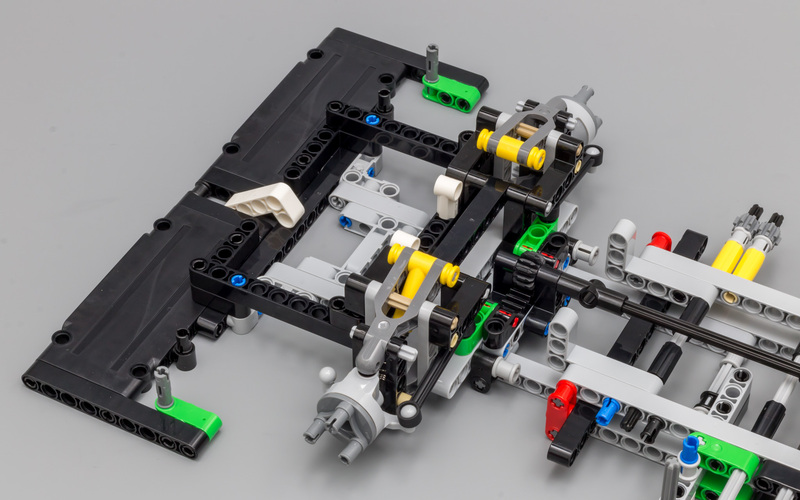 It fits perfectly well with the Mindstorms EV3 set. The curves on the side of the car are not as smooth as some of us hoped, but I still think the car looks more than acceptable from the side. The stickers add some nice details to the car, giving it that characteristic race car look. The model looks great in pictures, but it does even look better in real life. I love this picture of the front of the car. However, I do wonder if a dedicated 24 hour Le Mans Racer has the seat and steering positioned off-center?! Using the good ol' Google Machine I come to the conclusion that they do have centered seating and steering, at least the majority of them. There's ample space in the cabin, which makes me wonder why TLG decided to place the seat off-centered. The rear view looks cool too, with some of the suspension showing and the two exhaust pipes clearly visible. 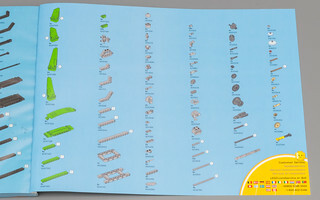 The bottom view is very useful to determine the size of the car in studs. 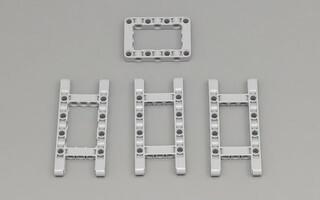 It measures approx 59 x 27 studs. The chassis looks organized and well designed. 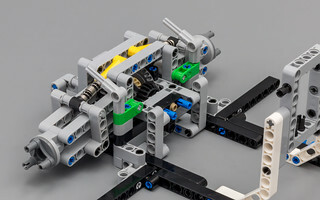 The engine has been placed close to the ground, which is perfect for the weight distribution. 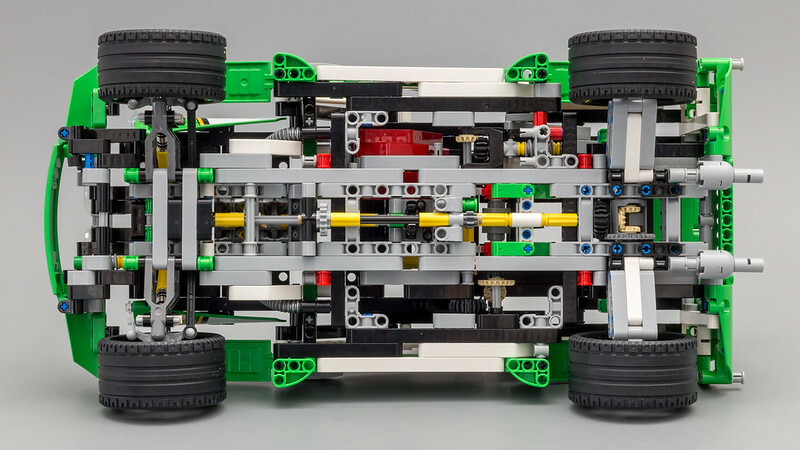 A low center of gravity improves the handling of the car. I really enjoyed building this baby. 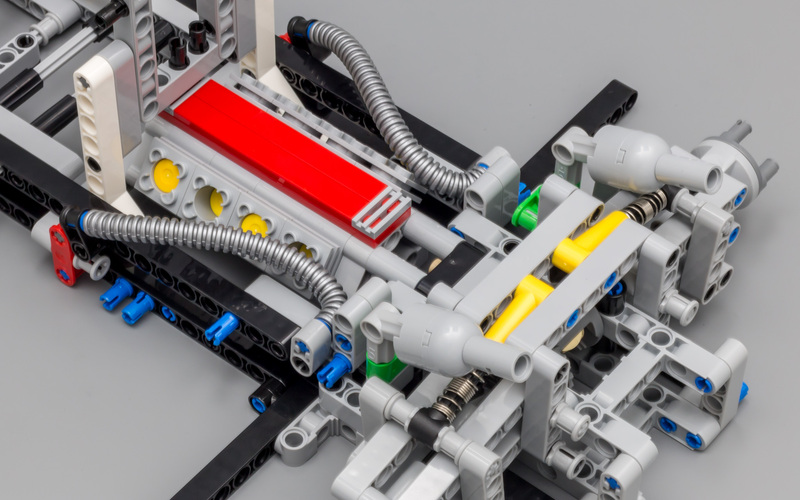 The build is very clean and organized, although there are some steps where you need to bend the beams a bit to get things into place. Seeing the model come to life and seeing it grow to pretty impressive proportions is very satisfying. 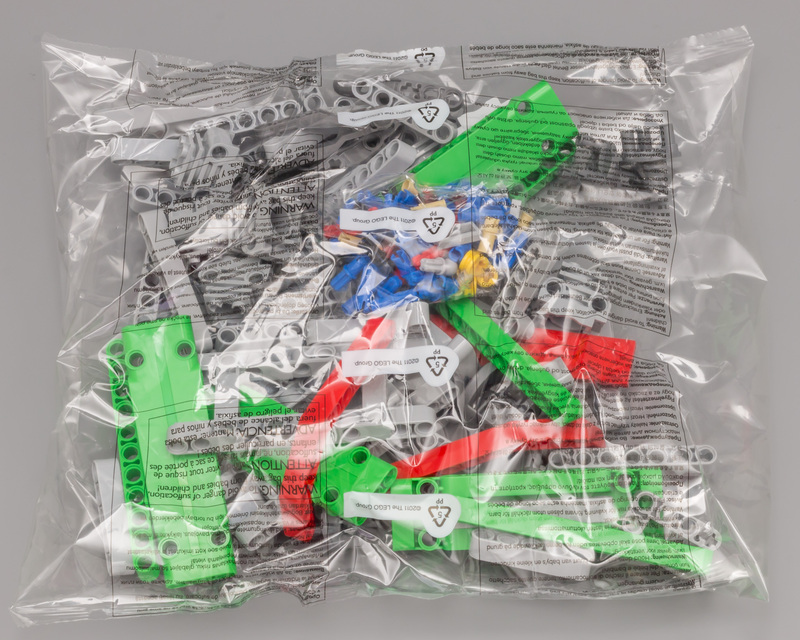 For me it was fun, but I reckon kids will go nuts over this set and the build. What became obvious during the build, but what's emphasized when you have finished the model, is that it's quite big! The size of the car is pretty impressive. 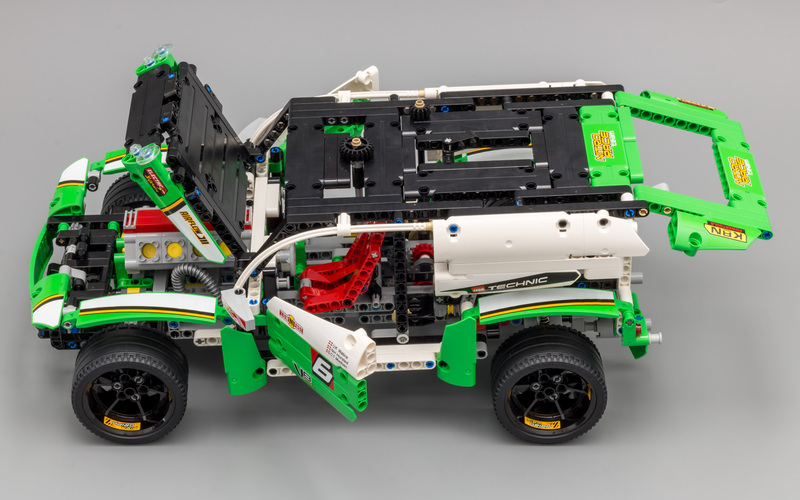 The pictures below show the car next to the 42030 - Volvo L350F. The side view emphasizes the size of the car. It's even longer than the Volvo, if you dismiss the bucket. 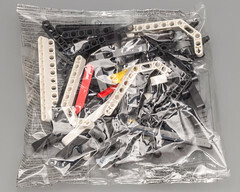 Some parts left. Nothing out of the ordinary. Unlike the B-model, this model doesn't implement any unexpected features. The functions it does implement are exactly what you would expect from any car. Unfortunately the steering wheel hasn't been linked to the HoG (Hand of God) steering mechanism. Placing the seat in the center would have provided an easy way to link the steering wheel to the steering mechanism. it's a shame we hardly see actual steering anymore. Opening the hood actually opens up the entire rear section of the car, providing you with easy access to the motor compartment. The mechanism to open the hood works properly, which results in smooth opening and closing of it. 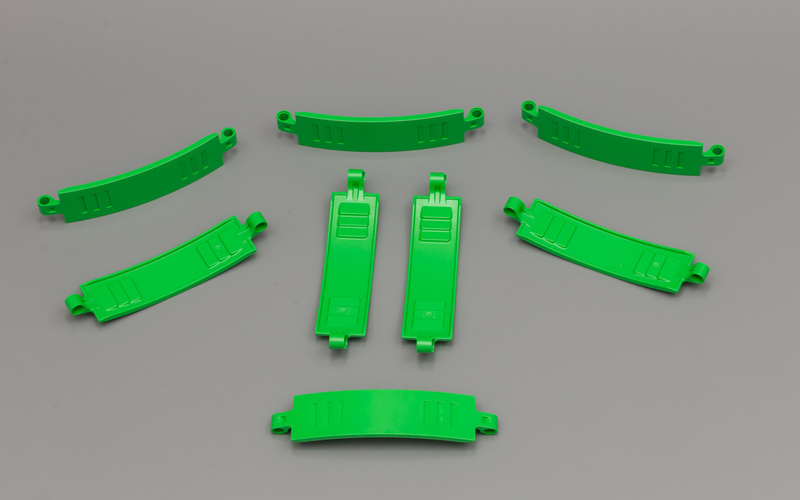 The same goes for the gullwing style doors. Both functions are operated manually and you need to switch with the lever to the left of the cockpit. These two functions are also the ones which can be motorized by placing an M-motor near the cockpit and a battery box in the trunk. All things considered I think this car offers lots of playability. 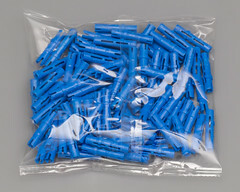 The model is solidly built and the functions are easy to operate. I'd say it's pretty safe to let your kids play with it. 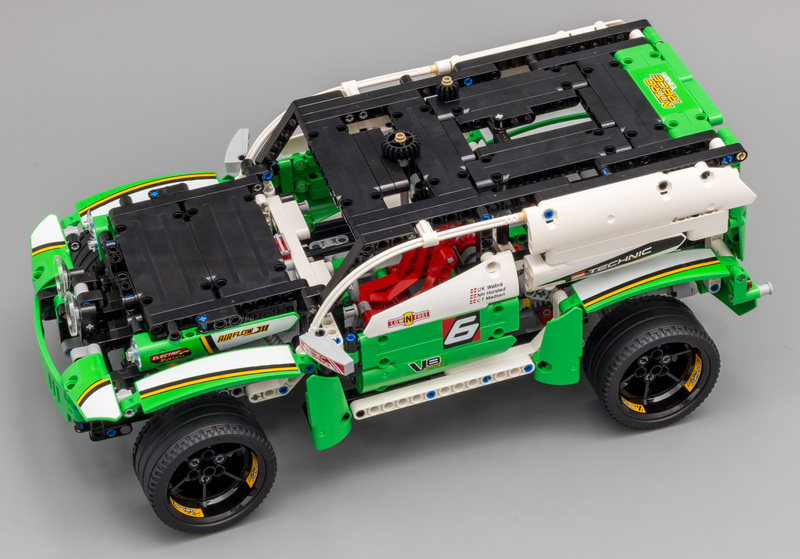 Unlike the A-model, the B-model for this set received (almost) universal acclaim, and I can see why. Often the B-model is a pale shadow of it's part donor. In this case the model looks so good, it could be a model of it's own. It even incorporates a neat feature, which actually deserves to be in the A-model. 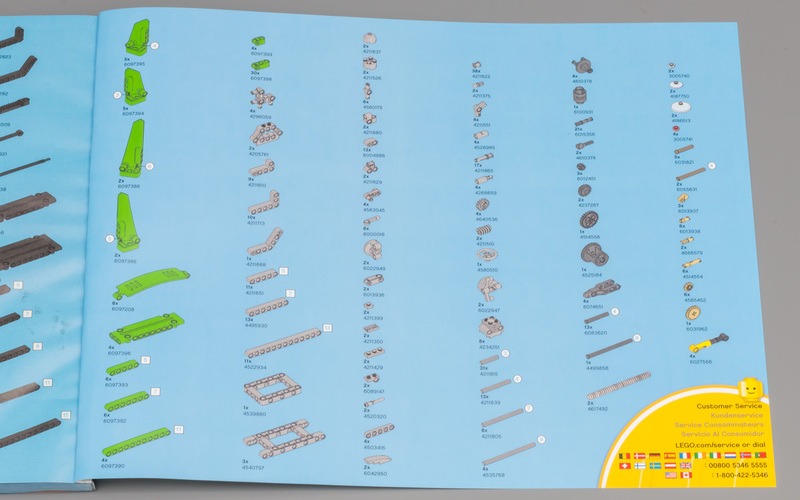 There's a lot a variation in the quality of digital building instructions TLG is providing, but these ones are of very high quality. 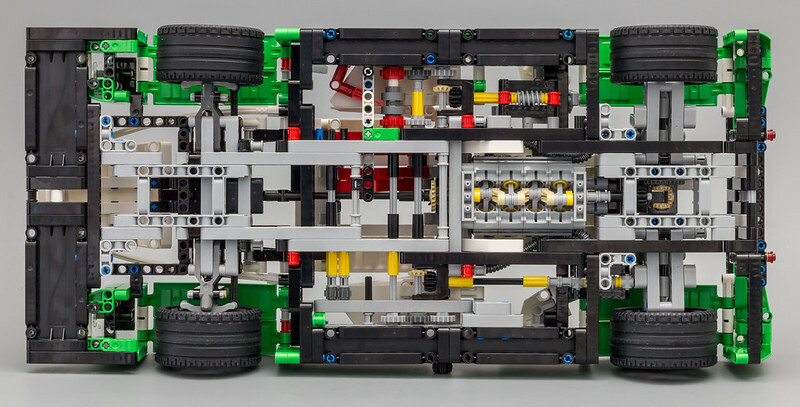 The picture below shows most of the chassis with suspension, fake engine and gearbox in place. Some concessions have been made, but overall the car looks fantastic. The black of the roof has been extrapolated from the hood, which definitely works for me. The rear section of the car feels a bit empty, but the panels do cover up most of it, so it's hardly noticeable. 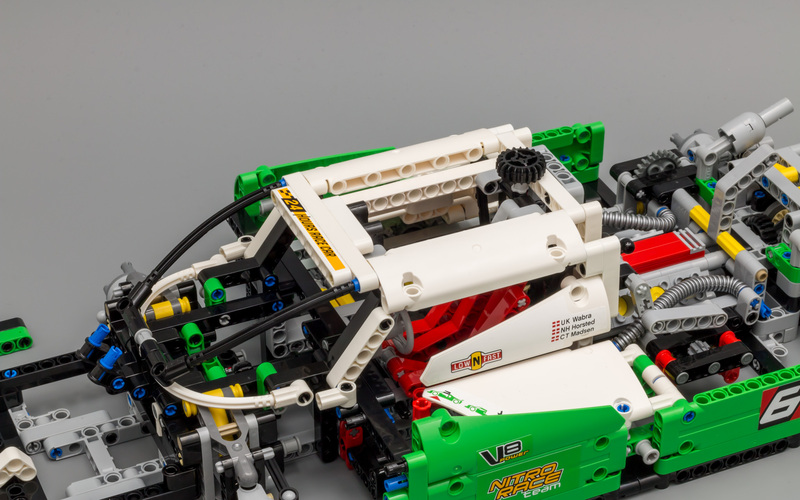 The V8 stickers will be upside down if you use the parts from the A-model. Since I could apply new stickers, I have placed them using the proper orientation. 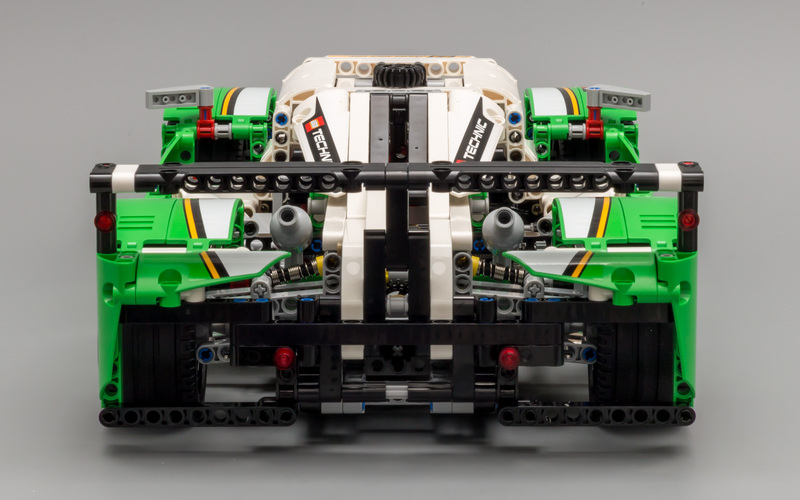 The bottom of the car shows the chassis. It's obviously a bit smaller than the A-model's chassis. Taking the functions into account, this model isn't playing second fiddle to the A-model. Besides the obvious functions like steering, opening doors and hood, this car features folding fog lights, which deserve a better podium than a B-model. One of the most interesting features of the B-model are the folding Fog Lights. It almost feels a bit weird that a feature like this is implemented in the B-model, instead of the A-model. 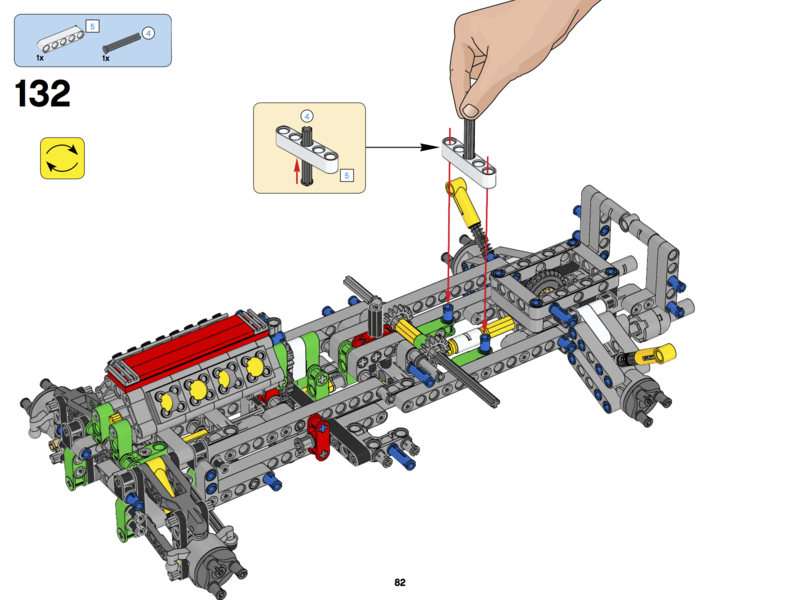 Below are 4 steps showing how the mechanism works. I have also included a video. 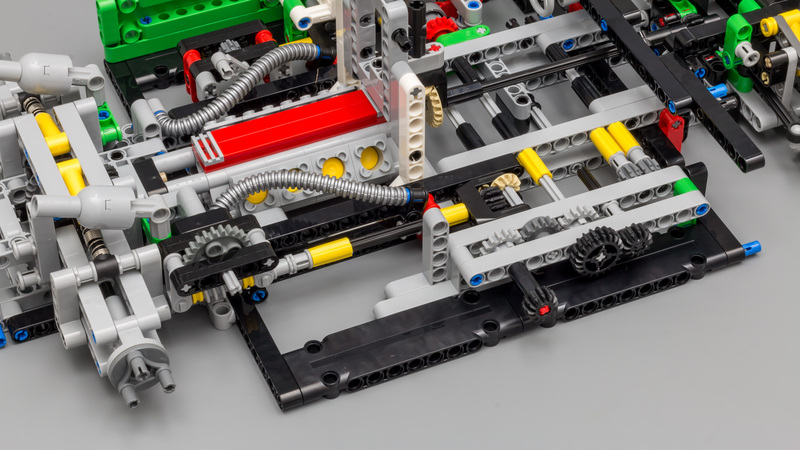 The mechanism is somewhat reminiscent of fork mechanism used in the 8109 - Flatbed Truck, which has been described in Efferman's Review. Take a look at the video to the fog lights in action. 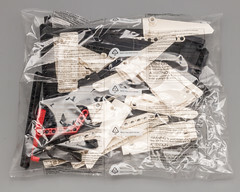 A fair number of parts left, which isn't uncommon for a B-model. 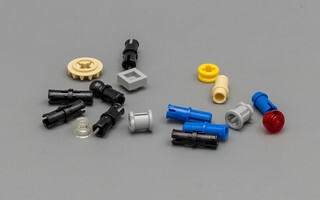 To summarize how I feel about this set, you need to take a look at the picture below. The combined image reflects the quality of this set....or better yet....sets! You actually get two great models, for the price of one. You don't like the A-model? No problem, you can have lots of fun with the B-model. I can't stop playing with the fog lights, it's mesmarizing. The color scheme on both models is outstanding. I simply can't emphasize enough how well this color scheme pleases the eye. 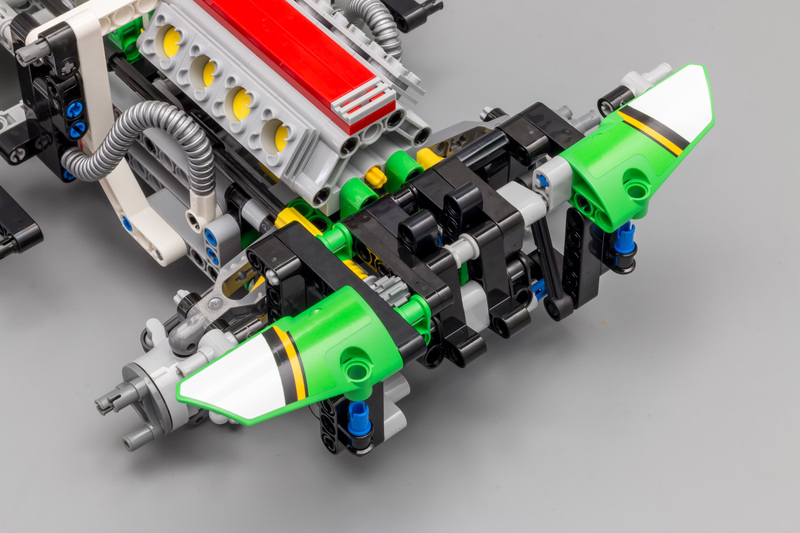 The regular green is dull and boring, but this bright green really pops out, especially when combined with black and white, and possibly some red details. Black, white and a little red?! Sounds familiar? 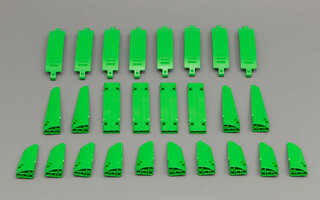 Yes, bright green can easily be combined with your EV3 robots. 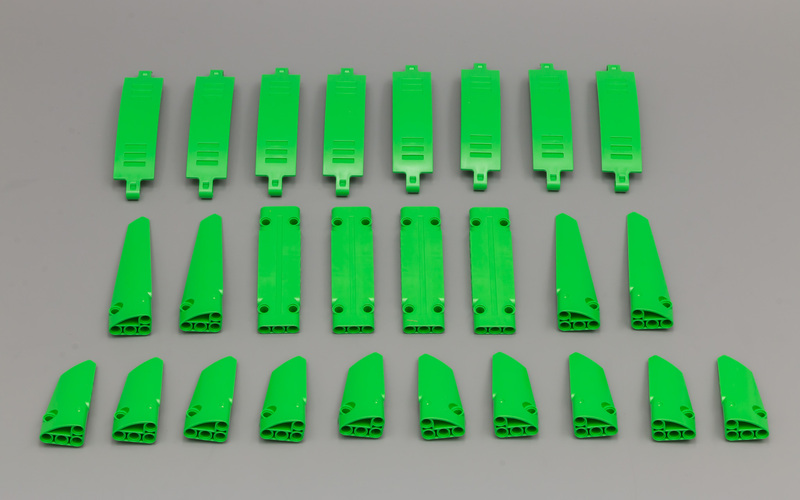 So while you are combining the bright green with your robot, why not use the great new curved "mudguard" panels. These new panels are introduced in this set and they look great. They open up a lot of possibilities in the design department. The build of the A-model is outstanding. It is fairly simple, but since it's so clean, I really enjoyed it a lot. I think the build should be entertaining, which doesn't mean it needs to be a real challenge. And let's be honest; when is a build really challenging?! 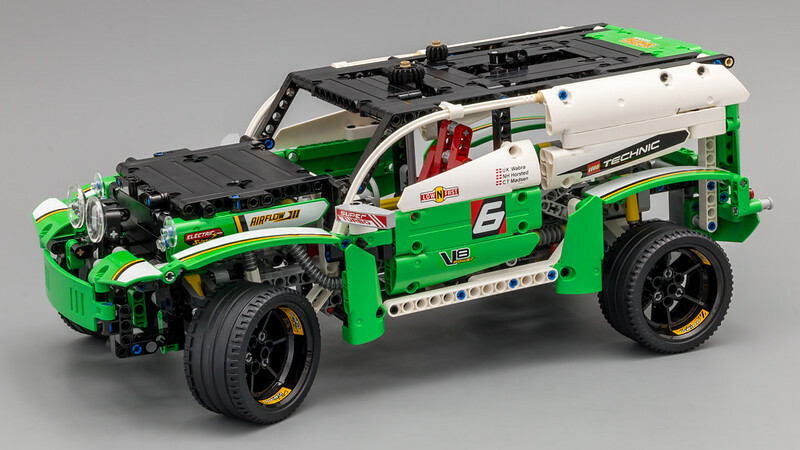 The rear suspension is a good example of why I liked the build. It's very simple, yet very effective. Works like a charm. The same goes for the other functions in both models. And the star of the entire show can be found in the B-model. How's that for a surprise?! Being aware of the fact that I like this model a lot better than most of you seem to do, I really encourage you to give this model a chance. 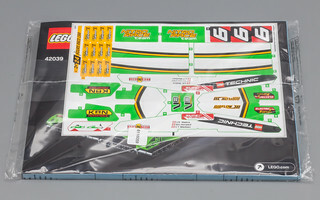 The sheer size is impressive, the color scheme is awesome and you get a bonus model, which is actually worth building. Open to debate, but I like it a lot. Superb function in B-model steels the show. Lots of new parts and cool existing parts. Two models for the price of one. I hope you enjoyed this review! More pictures can be found on my Flickr page. Outstanding review Jim, congrats ! Love the pictures, so clean and crisp :thumbup: . Hope to see many more of your reviews. 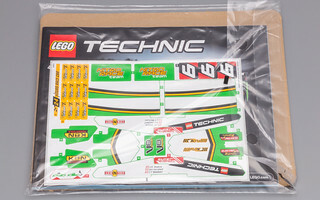 As for the set, after seeing this review I kind of like it, if I will find it at a decent price, I will get it for sure. Jim, great review as always. You convinced me to get this one of these days, although not a to priority. Any comments on which functions can be converted to PF and how well they work? Actually yes! I am in the midst of making a PF version. I will post a picture of the setup I have so far. 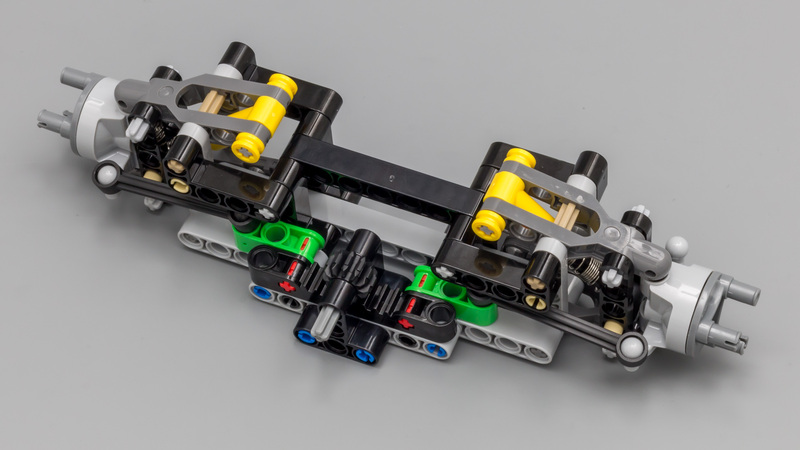 This setup is for driving the chassis and it works pretty fine! Thanks for a great review. I've got a pile of TRU and Lego credit I wanna spend and was thinking about getting this (since I got a sneak peak of your review in the Academy) but it's not here in the US yet. Too bad. Wonder when it'll hit? I do disagree about the manuals though. I find the thinner, stapled manuals easier to use than single large square-bound ones since they lay flatter when open. Have any links to the prelim photos of the front end? I don't remember seeing that and was curious how different it looked. I feel a bit sorry for you guys in the US. Well, you certainly have a point. Can't argue with that. i must have it somewhere. 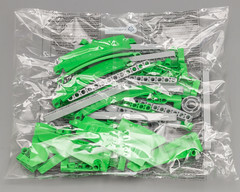 Great review,I am still undecided whether to get this set or not. Really thorough review, Jim. I am super jealous that you have 2 of these and I have none, with no opportunity to get one any time soon. Great review. I see now why the B model is so popular. I wonder though, on the car, if instead of the panels for the rear spolier (or wing) if they could have used studded panels and maybe layer them to give the appearance of, ie: a three element rear wing. I won't mention the front lights. If I had the money I would buy it for the B model. 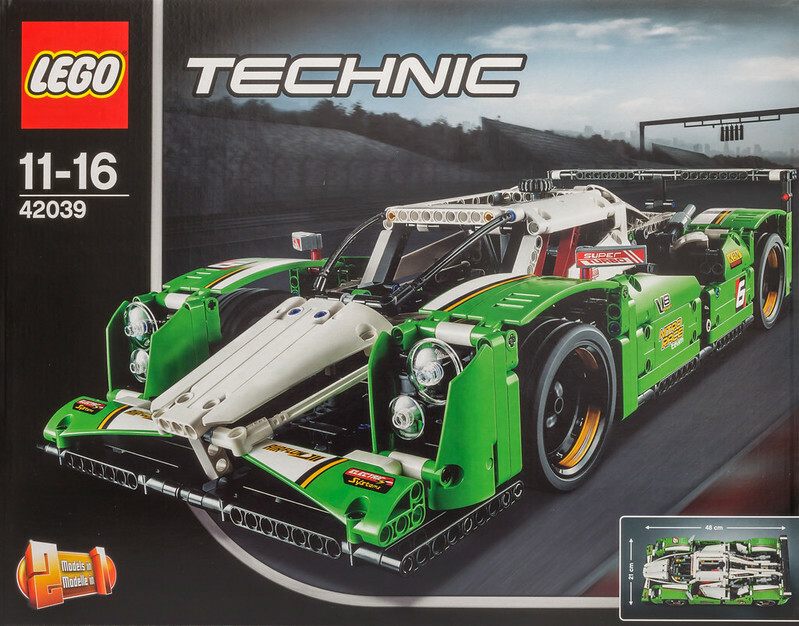 I think this set will be my next purchase. I love the color scheme and indeed it looks like a nice set. 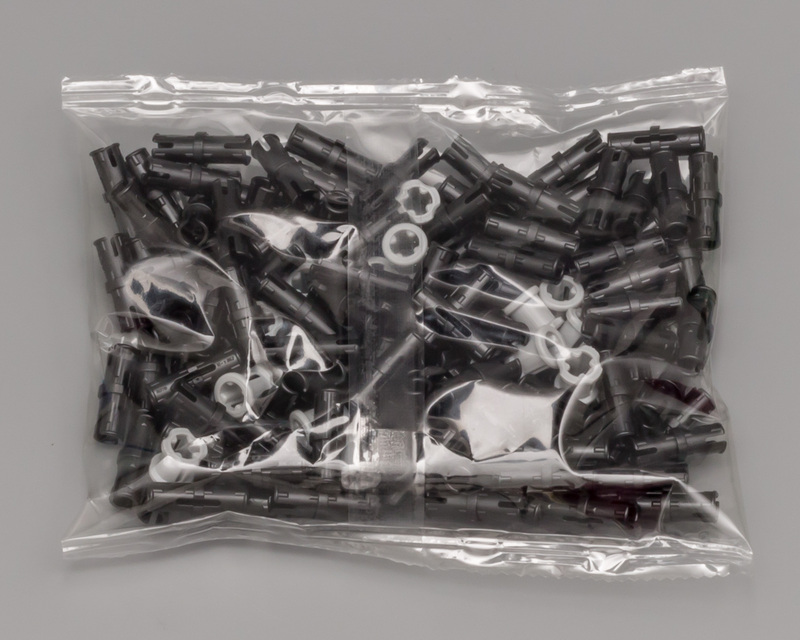 Also 1200 parts for EUR 100 is not a bad deal. And yes, the looks of the car have really grown on my since the first official pictures appeared. I'm curious how the bright green will work combined with other colors than white. 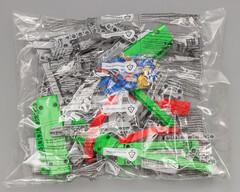 I really hope more sets in the future will use the color (so that more different parts will be available over time). I think I'm the only person on Eurobricks who doesn't like the looks of the B model, but I appreciate the extra functionality it offers. I think I read somewhere that the US will not get this set or the motorcycle until August 2015. That means the flagship most likely won't be in August but even later in the year... nothing Bricklink can't solve though. Fantastic review Jim, from the quality of the review alone it is easy to see how much hard work you have put into it. I'm with you on the instruction manual, I much prefer one quality bound book over umpteen stapled booklets. Already have 2 of these sitting in the build queue, one for display model as I'm a fan of this one and one to build the B model then dissemble for parts, so I'm already sold on his set but still very much enjoyed taking the time it deserves to read through the review and ogle at your pro photography. Great review with fantastic pictures. 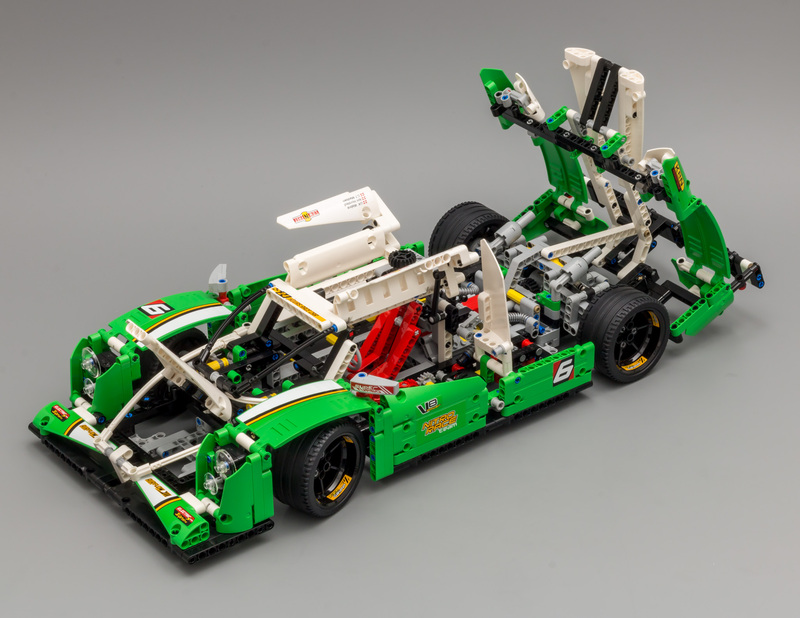 As for the model, I'm glad that they chose to make it less pretty - real Le Mans prototypes are rarely a sight to behold. It is function and aerodynamics over form. - The front shouldn't open like that - instead it should be easy to remove the whole front cover, leaving the suspension easy to work on. - The aero seems to be realistic, except for the rear end where there's no indication of a venturi channel. This should have been easy to include. - There is no fuel tank, nor fixed fuel connector right behind the cabin. 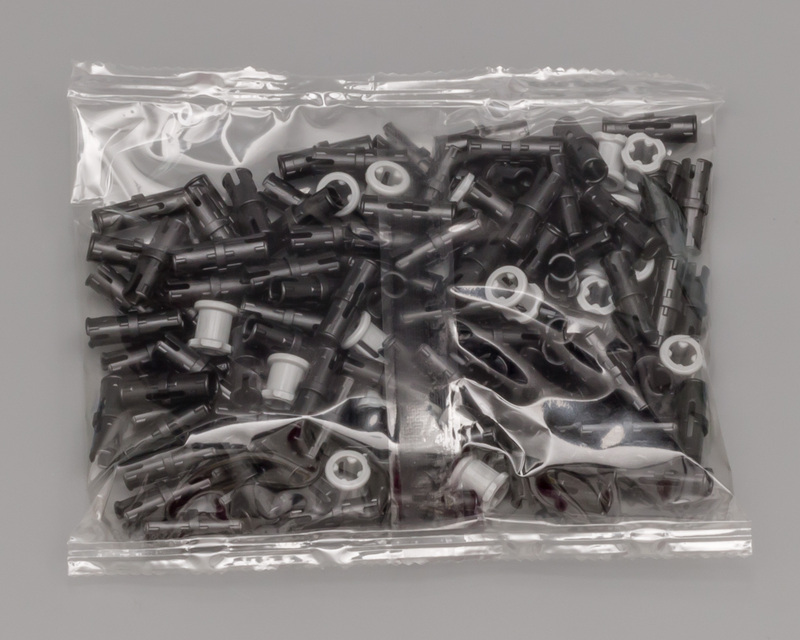 - There are no air jacks! Seriously!? 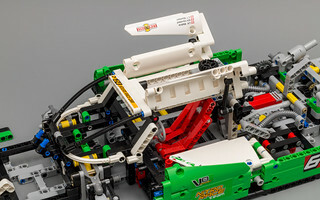 This is one of the most unique features of a race car like this... and LEGO forgot about them. 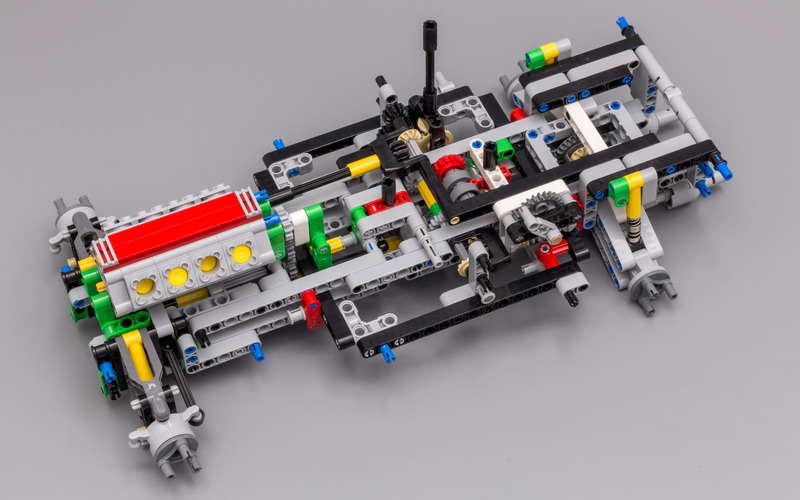 Instead they automated two functions which are manual on a real race car. - The top cars at Le Mans are hybrids with ingenious systems. 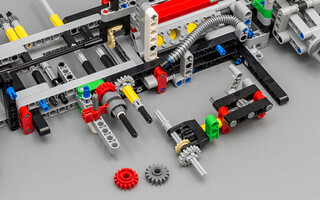 I would have loved to see the front wheels connected to some kind of spinning apparatus indicating a kinetic energy recovery system. If I get this set... I'm going to make some modifications. This is a mega review. You've taken the right pictures and the video demonstrations of the mechanisms really help get the good points of the set across. What's more amazing is that the review still feels very concise and to the point. 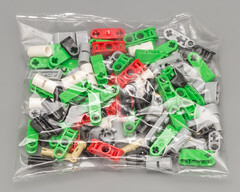 You've actually convinced me to put this set on my list and not just as a decent parts pack. I'm not sure air jacks are the feature that will have people fawning over this set, and pneumatics are being covered rather well later in the year ... but I agree with everything else, most notably removable front and rear bodywork (the removable engine cover on 8674 would be a good starting point here) and the inclusion of some nod towards a hybrid system. It's also worth remembering the preliminary design did have the Big Honking Fin (BHF) that is mandatory on all current prototypes, so maybe when that was removed any trace of a tunnel or diffuser went with it. On the subject of steering wheels, all modern prototypes actually have left or right hand drive. 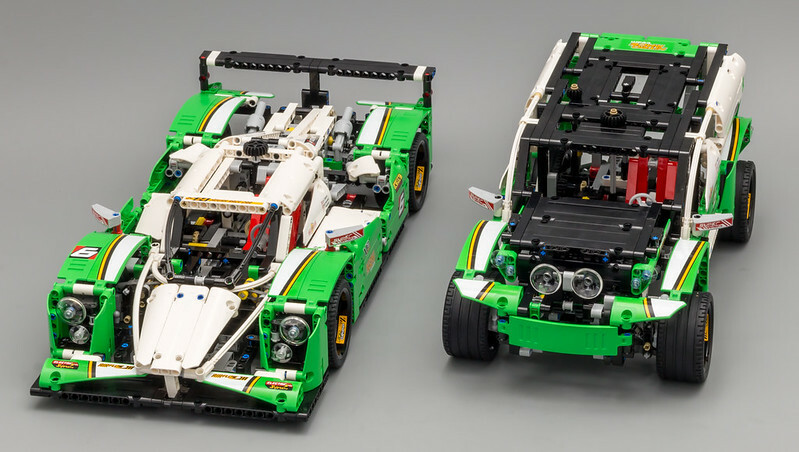 The regulations demand that both LMP1 and LMP2 cars are nominally capable of seating two people. Of course in practise the "extra seat" is taken up by the hybrid system in LMP1 and electronics/extra cockpit access in LMP2. However this doesn't change the fact that it would be easy to link the steering wheel to the HoG/front axle. 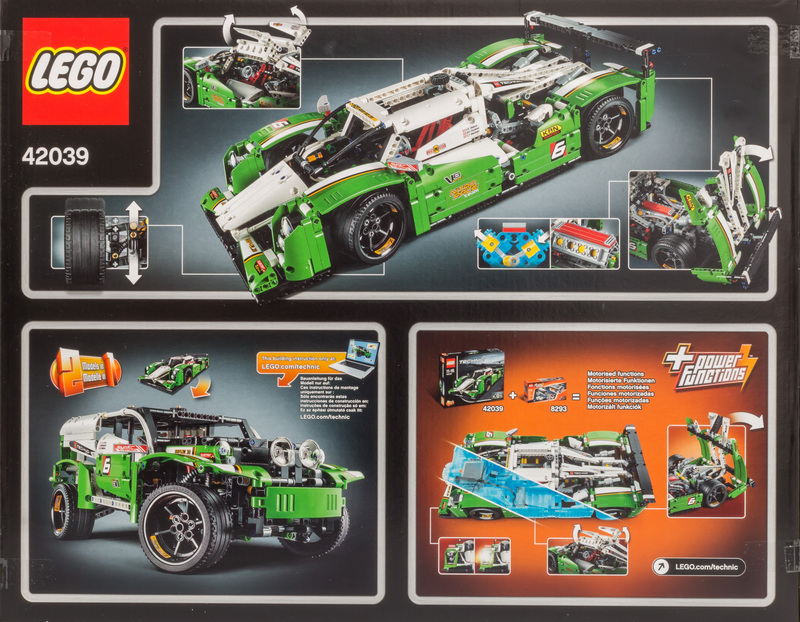 I was very skeptical of this set because I really thought the redesign degraded the looks of the A-model a lot, but after building it I must say this is an excellent set. Good job TLG! Ted, have you described your photography setup somewhere? I love the crisp quality of your pictures. Great review. 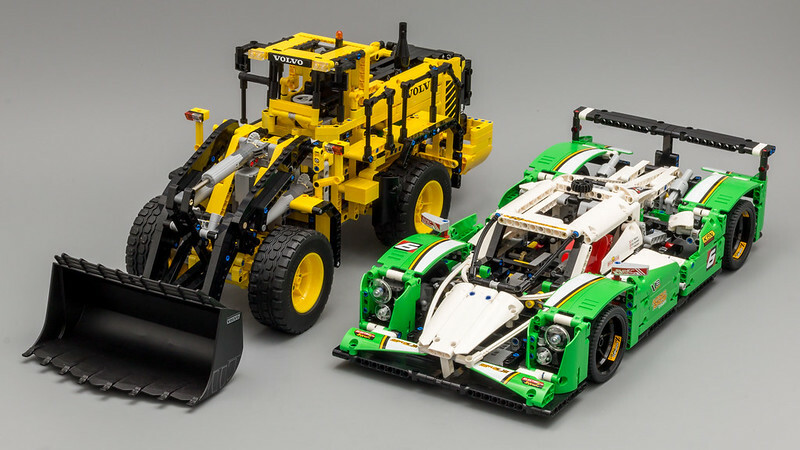 I think it look like a great set, both A and B. 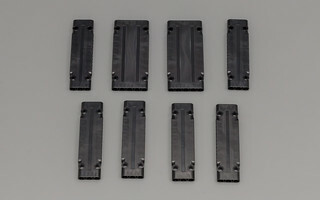 However the panels are the only thing I would need, but still a great looking set. A great review Jim. Just finished building this set. A couple of steps required abit of lego stressing to get together when there was an easier way. 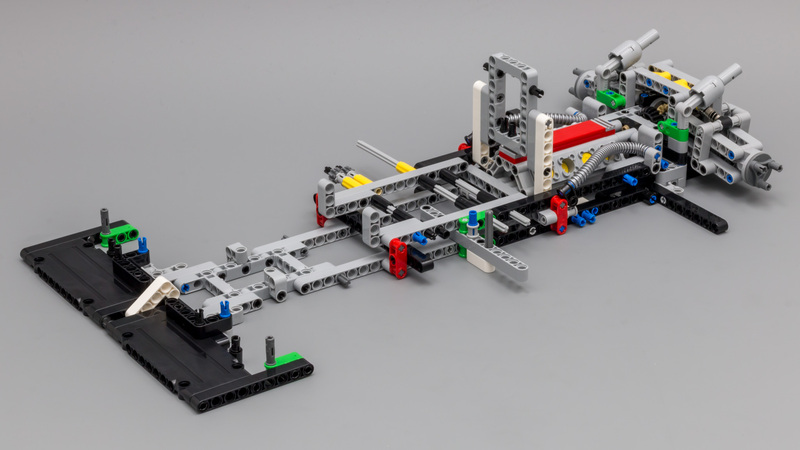 Just made it into RC ( almost finished it in LDD) which was easy to do as it has so much room for nearly any configuration of motors and not have them showing. A great set. Wonderful review, but I am still not sold on the set. If we get more sets with the bright green I might be tempted to get it, but until then it is too few parts in bright green (too few different types, not the number of pieces) to be able to use that colour effectively in making MOC's. True, but I must say I like the new colour, very 'fresh' looking compared to the rather dullish regular green. 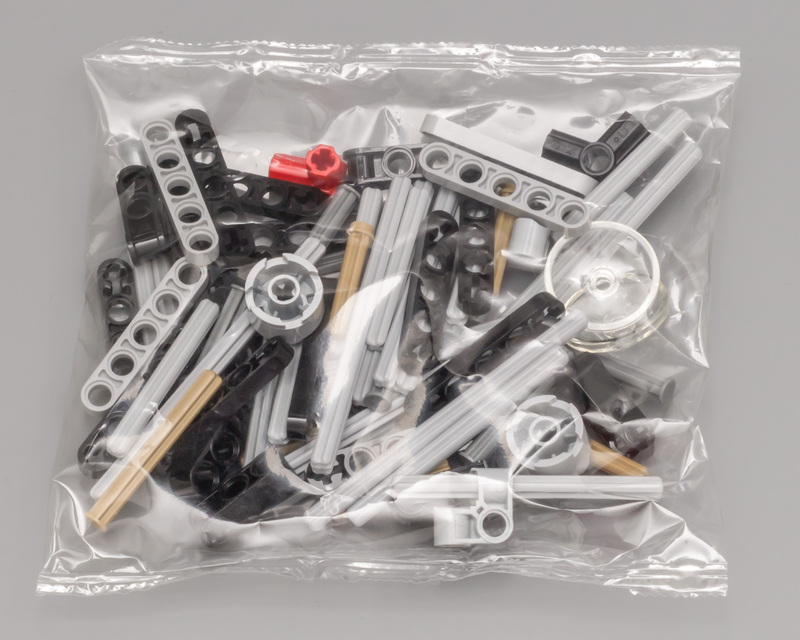 Can't wait to build MOCs with it.